The Romans enjoy entertainment at the amphitheater where gladiators fought each other or with wild animals. Condemned criminals were sometimes thrown to wild animals. The floor of the arena was often flooded with water for mock naval battles called naumachia. The greatest of all the amphitheater was the Colosseum. Another popular entertainment was chariot races, held in a vast oblong arena called circus. The Circus Maximus in Rome could seat more than 180,000 spectators. The Romans often attended the theater, where they watched Roman and Greek plays. Other amusements include ball games, board games, hunting and fishing. 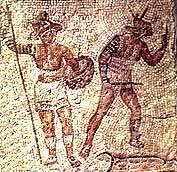 Gladiators - Gladiators were generally condemned criminals, prisoners of war or slaves. Some free men entered this profession in hopes of popularity and patronage by wealthy citizens. The free men were often social outcasts, freed slaves or discharged soldiers. They volunteered to be gladiators and by the end of the Republic made up half the number of combatants. Gladiators were trained in combat at special, imperial schools. Ludi - Ludi is public games the Romans took part in that were held in honor of gods and goddesses.